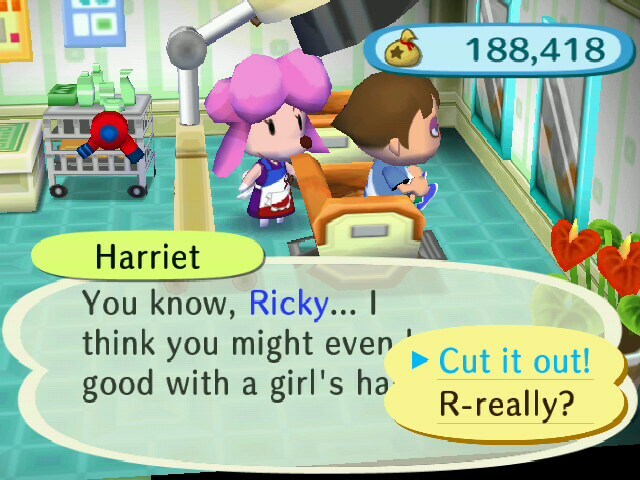 In the City, when you go to Shampoodle and talk to Harriet, after paying 3,000 bells, you can change your hairstyle, anywhere from the style to the color. Grown Up --> Big brother --> Um, receive it? Grown Up --> Big brother --> Um, give it? Grown up --> Businessman --> I'll risk it Grown Up --> Businessman --> I'll run away! Cute --> Not at all! --> Going out! Cute --> Not at all! --> Going home.. Cute --> To a T! --> Yep Cute --> To a T! --> Ew, no! Grown up --> Elegant --> Receive! Grown up --> Elegant --> Give! Grown up --> Alluring --> That's the idea Grown up --> Alluring --> I'll say, "Back off!" If you don't log in to a certain character for a long period of time, you'll get bed hair. It will be the same color as the previous color you had. The only way to remove bed hair is to have your hair restyled at Shampoodle's in the City. A) "Cut it out!" Prompts you back to the style questions for your own gender. B) "R-really?!" Prompts you to the question set for the opposite gender.